When it comes to the vital task of promoting environmental awareness in Connacht, nobody is doing more than McGrath Waste Management. The second-generation family business offers a full range of waste management and recycling solutions to both commercial and domestic customers in the region. These are exciting times for McGrath Waste Management who, to coincide with their 40th anniversary in 2017, relocated to a new €2.5 million state-of-the-art waste transfer station in Quarry Point Business Park, Moneenbradagh, Castlebar. The new facility replaced two smaller waste transfer facilities in Killala and Moneen and led to the creation of 20 new jobs, bringing the current workforce to 50. The opening of the new transfer station has not only allowed McGrath Waste Management to grow its business, but also enabled it to achieve a number of accreditations, including ISO 9001:2015 Certificate of Registration for Quality Management Systems, ISO 4001:2015 for Environmental Management Systems and OHSAS 18001 for Occupational Health & Safety Management Systems. Further recognition came the company’s way when it was nominated in two categories (Regional Transport Operator of the Year and Women in Transport) at the 2018 Fleet Transport Irish Haulier of the Year Awards, which were held in Dublin’s Citywest Hotel on October 11 last. Established by Paddy and Nora McGrath to recycle and dispose of waste for Travenol Laboratories – now Baxter – in Castlebar, McGrath Waste Management has come a long way in the last four decades. Now managed by their son Declan and daughters Sinead and Ger, the firm facilitates a disposal and recovery service of recyclables and general waste for large multinationals and SMEs in the Connacht region. Additionally, it collects over 100 skips per week from various industries and households through Mayo and Sligo, and operates a wheelie bin collection service for over 7,500 domestic customers in the same two counties. “It’s been a hectic couple of years for us,” explains director Sinead McGrath, who was shortlisted for the aforementioned Women in Transport award. “We moved into our new waste transfer station in October 2016 and the official opening was performed by the then Taoiseach Enda Kenny TD the following May. We were also voted Mayo’s Friendliest Business for 2017 and were runner-up for the national award. We’re growing all the time and are happily settled into our new premises, which is much more centralised and has the capacity to cater for our customers’ needs well into the future. 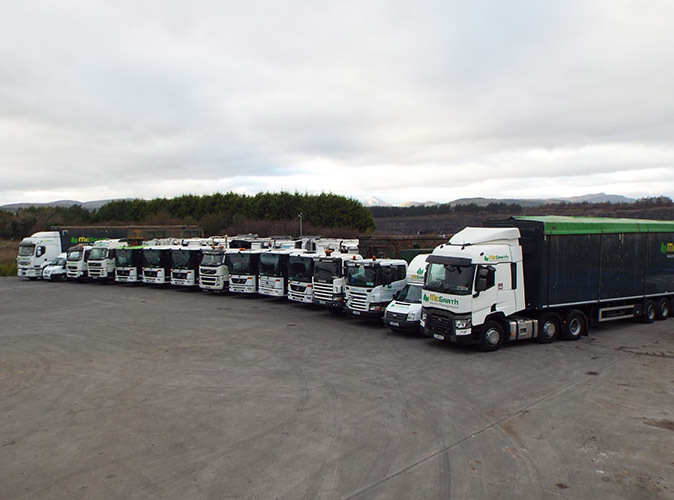 Proud to be Connacht’s largest waste stream collection, transportation and recovery firm, McGrath Waste Management runs a mixed fleet of 20 vehicles consisting of articulated trucks with BMI walking floors and ejector trailers, bin lorries, hook loaders and chain skip lifts. The trucks are a mixture of Scania, Mercedes-Benz, Renault and Volvo, and are maintained inhouse and by Shaw Commercials and Molloy Commercials, both of which are locatedin Castlebar. Traditionally, all waste collected in this country was sent to landfill sites, but now the emphasis is on moving materials up the waste hierarchy by directing it away from landfill sites towards a waste-to-energy process. The old adage of ‘waste not, want not’ is key to McGrath Waste Management’s ethos. “Our goal is to recover and recycle as much waste as possible and to divert it away from landfill,” Sinead says. As well as specialising in the collection, transportation, recovery and disposal of residential and commercial waste, the firm offers services such as loose and bailed cardboard collections, office recycling boxes, confidential shredding services, skip hire, roll on and roll off hire, and static and portable compactors. As a family-run business, McGrath Waste Management is large enough to cope and small enough to care. The McGrath’s have the experience and expertise to meet your specific requirements while providing a fast, reliable, professional and courteous service. McGrath Waste Management provides a three-bin kerbside collection for general waste (green), recyclable items (blue) and food waste and other compostable waste (brown). Their skip hire service is popular with businesses and households alike. 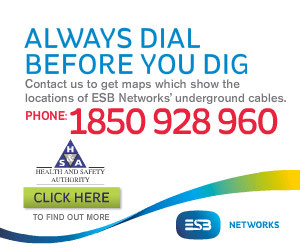 The skips come in three sizes – 8-cubic yard, 12-cubic yard and 20-cubic yard. The 8-cubic yard skip is the most popular, being ideal for house / shed clearances and DIY purposes. The 12-cubic yard skip is ideal for large house clearances, while the 20-cubic yard roll on, roll off skip is suitable for large-scale clear outs, large home or commercial renovations as well as large-scale construction and demolition jobs. This exceptional firm has no intention of resting on its laurels and plans to open a public civic amenity site in the near future. These facilities are designed to allow the public to bring their general waste and recyclables to a centrally located site. Civic amenity sites promote recycling and help to increase the amount of waste recycled in Ireland each year. “We look forward to helping you with your disposal requirements, whatever the size,” Sinead concludes.